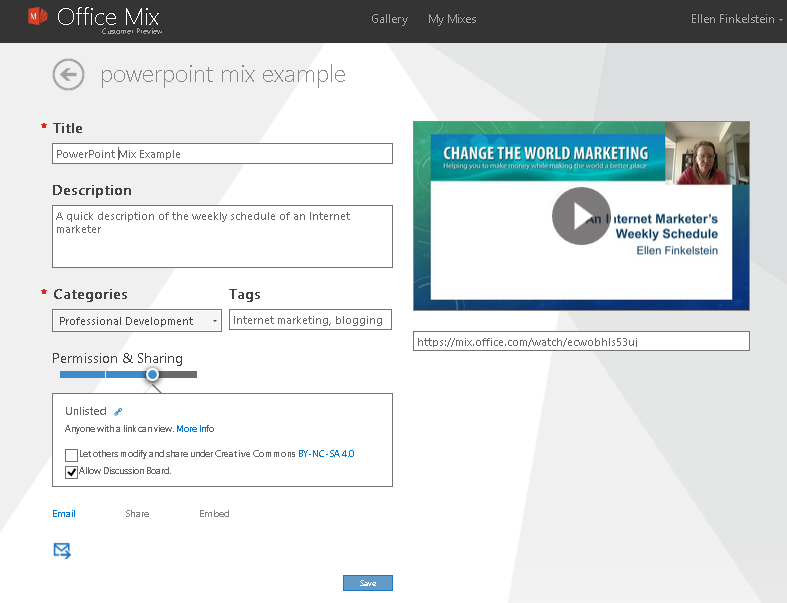 PowerPoint Mix is a new PowerPoint add-on by Microsoft. 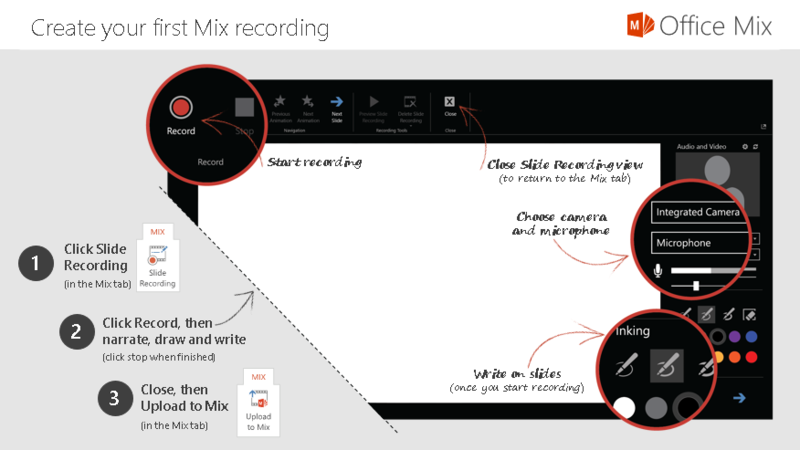 You create slides and can record audio and video. You upload the final result to the Mix website and share it with anyone you want, such as your students. You can even export Mix to a SCORM-compliant format. You get statistics about who watched the Mix as well as quiz scores. Start by watching the videos at at the Mix website. One is an introduction, the next is a series of tutorials. Then I suggest looking at the gallery, here. Avoid the long ones — just watch some short ones. Some are very professional, others not. As you watch the videos, you’ll be prompted to download Mix, so go ahead. You’ll see instructions to install it and when you do, you’ll have a new Mix tab on your ribbon, like this. PowerPoint re-opens (you have to close it to install Mix) and you’ll be in a special presentation that shows you some of Mix’s features, as you see here. 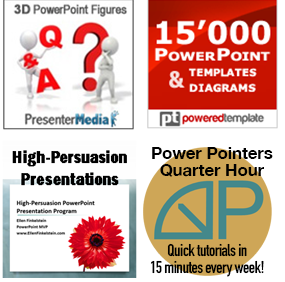 You can use an existing presentation or create a new one for your Mix lesson. A recording, during which you can record both your voice and your webcam. Choose Slide Recording to start. You can see the recording screen below. As you record, click the Next Slide arrow to move to the next slide. Each slide’s recording is separate. Click the red Stop recording button on the right when you’re done. You can preview each slide and redo it if you want. Click Close when you’re done. Quizzes. Choose Quizzes/Video Apps and choose from 3 types of quizzes and a poll feature. The quiz interface is pretty self-explanatory and one of the video tutorials explains it. When you’re done, click Upload to Mix and wait while the Mix is uploaded and formatted. You can also choose to output to a video (non-interactive, but viewable offline), export to SCORM, or export to an online video on Office 365. Here’s what the screen looks like. Make any changes you want and click the Save button. Click the play button on the right to play your Mix! Below I’ve used the Embed code to embed my mix in this blog post. After watching the 2 slides that I recorded voice and webcam for, you’ll see the quiz slide. You might have to scroll down to see all of the answers. After choosing your answer, click the Submit button to see if you got the question right. 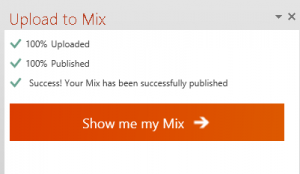 You can go to mix.office.com at any time and choose My Mixes. There you can choose one of your mixes and click Analytics to get information like how long a slide was watched and how people did on your quizzes. What do you think? Will you try it out? Leave a comment! i remember trying to record audio within PPT and the sound was absolutely horrible…could not be used. Have they solved this problem? Harvey, I think they improved the sound in 2010, but maybe 2013. I think that if you use a good mic, you should get decent sound. Do try it. Let me know your experience. Ellen,the very first link – watching the videos at at the Mix website. – gave me a 404. My husband and I have started using Mix. He teaches statistics and recently used the Screen Recording feature to record his lecture in Excel. Several demos go out to websites with this feature but if an Office application is the last window open, clicking on the Screen Recording goes to that application rather than a website. you are then live in the application and all keystrokes are recorded. Sound was good just using his laptop microphone. I have been spreading the word about Mix to other faculty/teachers. FYI: Once you download the link, click on Templates at the Mix tab. There is a more detailed training file that that goes into more details than the PPT that shows initially with the download. Would love to hear how others are using this great new PPT feature. Ron, yes, my mistake. The right link is https://mix.office.com/Home/GettingStarted. Wilma, thanks for sharing your experience with this and also how to find more training! Your presentation won’t show on my Android. The error message says that the video option wasn’t enabled by the author – is that a bug that prevents playback on mobile devices? I’m on a PC using Windows 7 and IE 11. 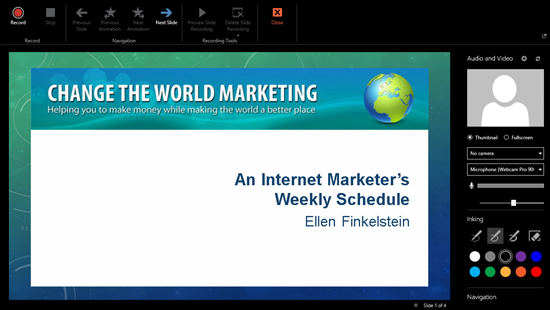 Ellen–once in mix, I am not sure how to go to a hyperlinked video. Usually in powerpoint slideshow mode, the hyperlinks can just be clicked. While recording or viewing a mix, they seem to not be active. I will play with it for awhile, but do you know how to do it? Ellen, thanks for the article! A tiny fly in the ointment – it’s crucial to understand that Office Mix has its restrictions. Some users raise their expectations so high, they believe Office Mix even supports all PowerPoint effects. Well, it doesn’t. For instance, triggered animations and some sound effects are sure to get lost along the way. I made a little tutorial about making video lectures that mostly covers Office Mix – https://myelearningworld.com/engaging-learning-101-how-to-make-video-lectures/. Would be great to learn your opinion on this!